FCPO: The Upper Range Is Broken, Bulls Coming Back 30th Oct 2014. Thursday, 30th Oct 2014. Palm oil futures is likely open higher today judging on promising recovery in Soy oil futures. Soy oil futures for Jan contract was traded at new high at around 34.51 cents per pound as the time of writing. Other news to follow. "-The Dow Jones Industrial Average snapped a four-day winning streak on Thursday, after the Federal Reserve made official its plans to end the last round of its recession-era stimulus program. Most major stock benchmarks slipped lower, after an initial knee-jerk bout of panic, in the wake of the Fed’s policy decision, which came just after 2 p.m. Eastern time. Stocks did recover somewhat, but still ended Wednesday’s trading session in the red. The S&P 500 SPX, -0.14% closed 2.75 points, or 0.1%, lower at 1,982.30. The Nasdaq Composite Index, which was already under pressure from Internet stocksCOMP, -0.33% lost 15 points, or 0.3%, to 4,549.23. Meanwhile, the Dow industrialsDJIA, -0.18% ended down 31.44 points, or 0.2%, at 16,974." "-The Hong Kong Stock Exchange (HKEx) announced Sunday that it did not know when the Shanghai-Hong Kong Stock Connect, or “Hu-Gang Tong,” would be launched because it has not received the central government’s approval. Fears of the program being derailed by pro-democracy demonstrations in Hong Kong were voiced before the HKEx 0388, -0.12% HKXCF, +1.98% announcement. The Hong Kong Commercial Daily, a Chinese-language newspaper sold in the city and in neighboring mainland areas, cited an anonymous source as saying Hu-Gang Tong will probably not be introduced by the end of the year because central government authorities think the atmosphere in the former British colony is causing bad timing for any new economic cooperation scheme." KUALA LUMPUR: The Malaysian Palm Oil Council (MPOC) expects crude palm oil price (CPO) to increase to between RM2,100 and RM2,500 next year, lifted by factors such as biofuel demand and petroleum price level. Its chief executive officer, Tan Sri Yusof Basiron, said besides supply and demand, biofuel demand and petroleum price level would determine whether more or less of biodiesel would be used. "The announcement by Plantation Industries and Commodities Minister, Datuk Seri Douglas Uggah Embas, to impose a requirement for biodiesel to use seven per cent palm oil, from five% now, was a way to firm up the CPO price," he told Bernama yesterday. Basiron said this on the sidelines of MPOC's International Palm Oil Trade Fair and Seminar 2014 here. Uggah had said the move aimed to lower stocks and boost prices that had declined by over 20% this year. The implementation would start in stages from November in Peninsular Malaysia and in Sarawak, Sabah and Federal Territory Labuan by December, he said. Basiron said the government also tried to remove depressing factors on prices by providing export duty exemption for CPO. "This would remove any bearish factors affecting palm oil price. "The move will also stimulate the country's export and help rationalise the stock level," he said. 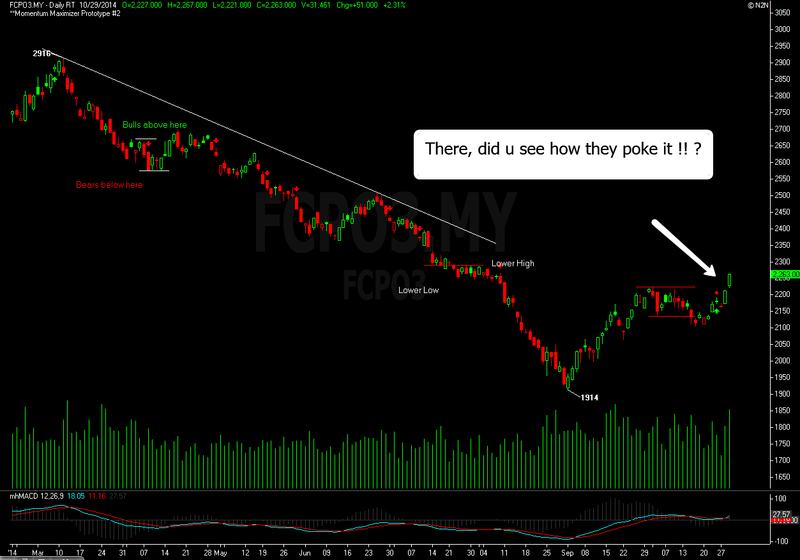 Source : Bernama"
FCPO- The Bulls Are Out Of The Cage. Palm oil futures rallied to multi sessions high and closed at 2,267 yesterday amid strong rally in Soy oil. More promising rally is about to happen again today as Soy oil manage to record about 0.80 cents rally overnight and it is still rallying at the time of writing. Yesterday market frantic rally may contributed by the news of declining output in palm oil top producer and depleting inventories as well. For whatever the reasons were, again, it is not a must that the trader knows it, but it is compulsory for a trader to consistently follow the trading plan before him, period. I for an instance, does not know such news until today, so does it make me to less informed to other trader in the market ? The answer is no doubt yes, I am less informed on this news and I did not care because it was not the news that made me enter and exit my positions based on these kind of news. I have a plan, and it was crucial for me that I trade based on that plan. Staying and working according to the your tailored made plan or system is the best edge you have, to stand a chance winning in the long term. News or known as external factors in my vocabulary did not give me any measurable technique to use in the market. By the time I knew there was such news, it was already too late as the price would have moved away from your exit point. Back to palm oil futures outlook, "the bulls are indeed out of the cage," and it might continue to charge further until there some indication in hourly chart that may suggest slowing down. For this week, resistance is pegged at 2,325 while pivot support is located around 2,233.